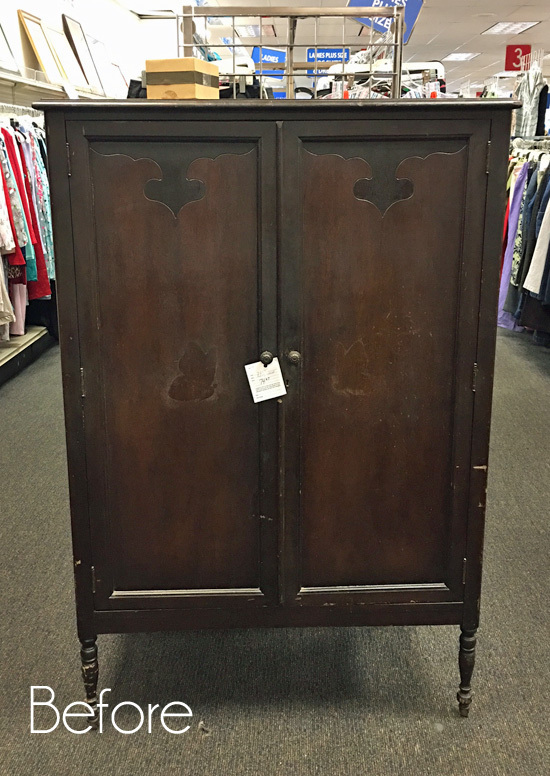 I’m sharing an armoire I picked up at the thrift store for $75 a couple of months ago. It was showing some age for sure, but a steal at $75! 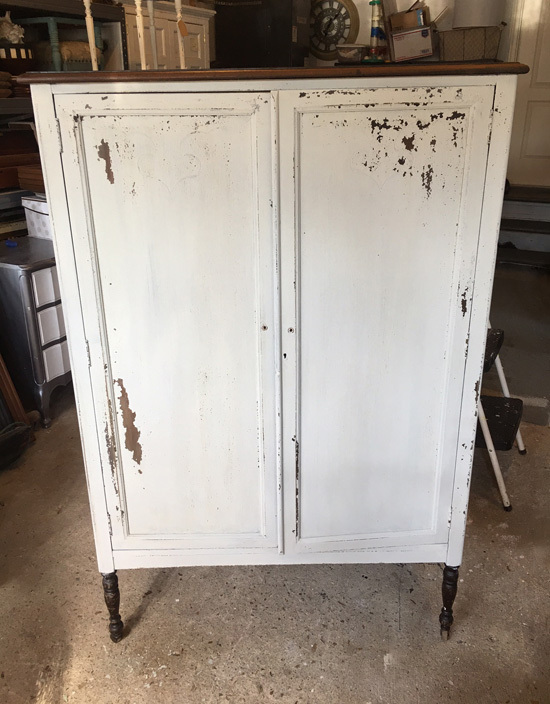 I thought this might be the perfect piece for milk paint. Wouldn’t it be so pretty with a perfectly authentic looking chippy finish that milk paint is so famous for? What? You don’t like it? 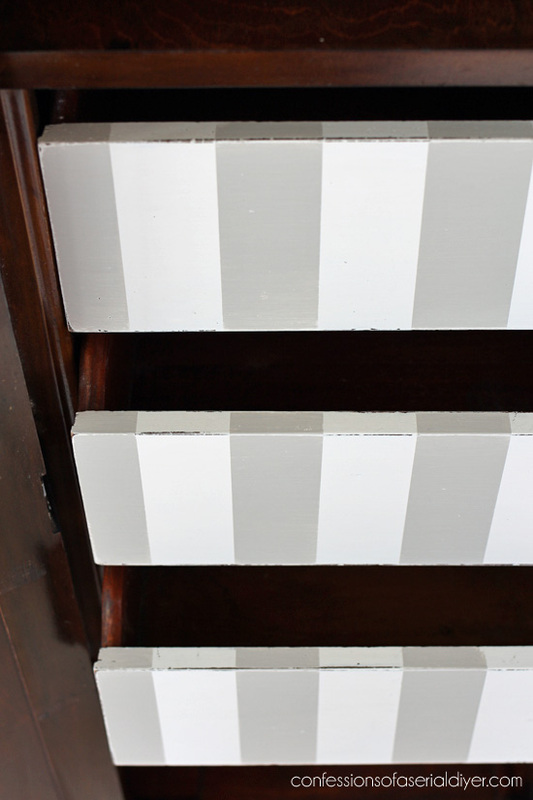 Ah milk paint…I love you and I hate you. These were photos I sent to my Mom while I was working on it. It continued to flake off way more than I liked. This definitely was NOT the perfectly chippy finish I was imagining in my head. 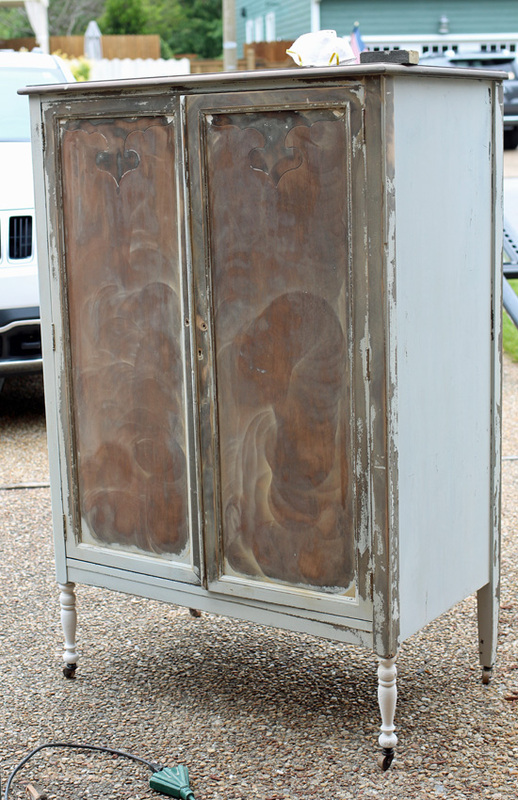 I felt so bad for doing this to my pretty armoire. It was also bleeding through and just looked old and dirty. Ah better. This is Annie Sloan chalk paint in French Linen mixed with about a third of Pure White. I don’t want to feel angry when I paint. 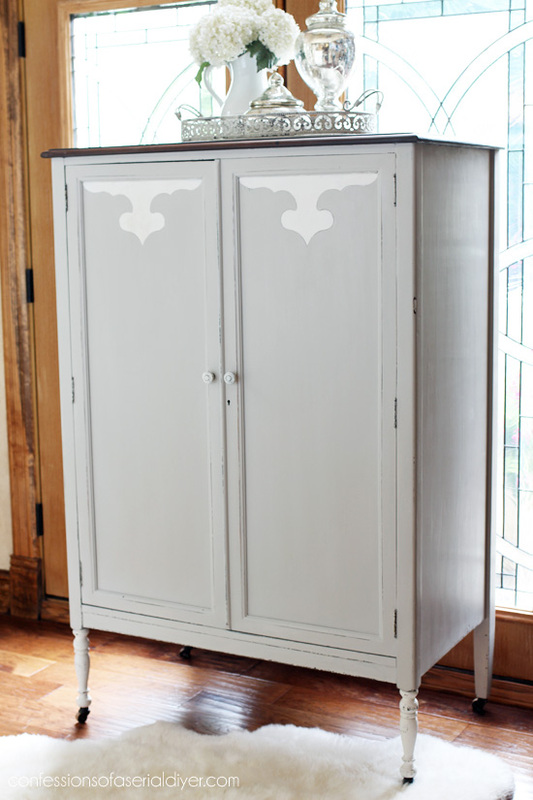 I love painting furniture, so I think that’s the end of me and milk paint. I sealed the outside with Annie Sloan’s clear soft wax. 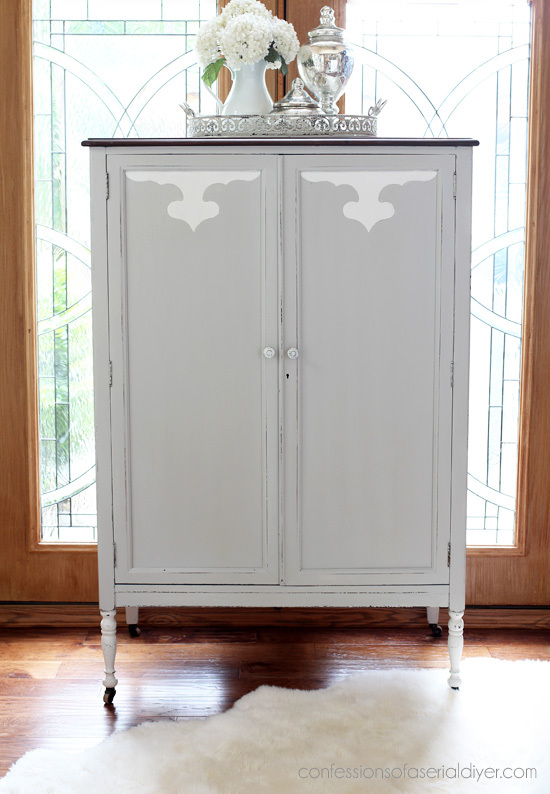 See my tutorial for painting furniture with chalk paint HERE. It was in beautiful condition, and had absolutely no odor, so I just gave it all a quick spray of shellac to freshen up the finish. Then I painted the drawer fronts. It may not have the delicate chippy finish I was longing for for this piece, but it looks pretty and well-cared for now. It ended up being more work than I bargained for, but I’m really pleased with the results! Can’t wait to see them myself! Check out all my previous Furniture Fixer Upper posts HERE. UPDATE: Bam! No need to wait…check out the makeover of this little cutie HERE now! LOVE, LOVE, LOOOOOOVE this piece!! That turned out amazing, so glad you didn’t like the milk paint finish. Round 2 turned out so much better. I would find room in my already to full house for that piece. Some times I find that a few curse words make the project turn out so much better, as is the case with this piece, BEAUTIFUL!! Oh Christy! The armour turned out gorgeous! I love a piece with the dark wood and white paint. I’ve been planning to paint some side tables white and stain the tops dark. I’m new to your blog! Hello! Did I see butterfly’s near the doorknobs? If so, and it’s not my very early in the morning eyes I would loved for you to have kept them. The piece is still beautiful! You, yours and your readers have a great Memorial Day weekend also. 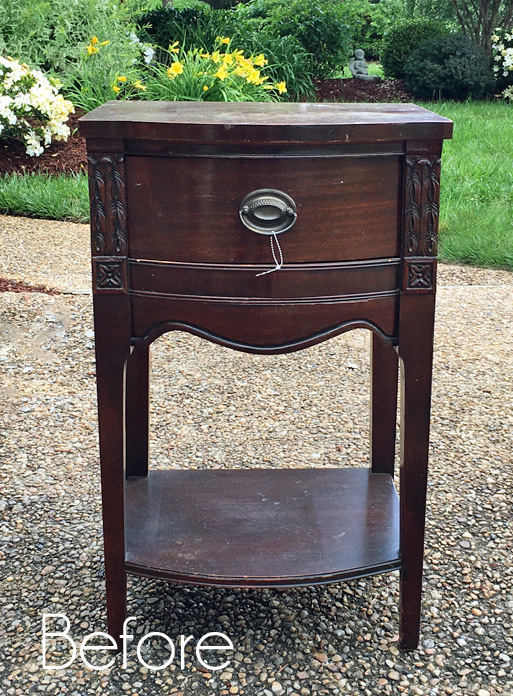 Great restore on an old, beat up piece! I so agree with you about milk paint. The “perfect” flake is so hard to achieve and I honestly think it works best on really primitive pieces without a whole lot of detail. Did you use Miss Mustard Seed’s paint? It works pretty well and there are additives to keep the flake more limited. 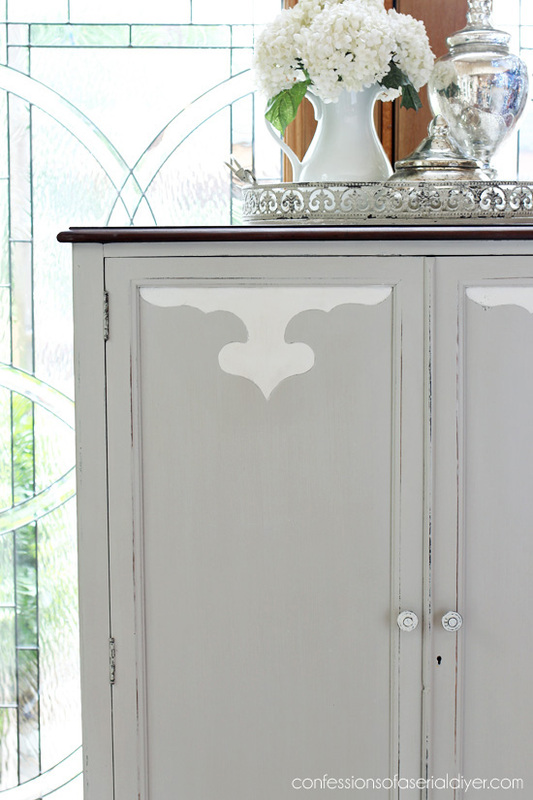 Chalk paint is reliable, distresses easily and there are few surprises! Though I usually make my own version of “chalk” paint, I recently picked up several jars of Buttercream that was discontinued at Joann’s. I am really sorry they discontinued it because it is fabulous! I loved the chippy! And I love the new look too. I totally get why you changed it up as it isn’t for everyone. You tried and made it fabulous. Great save!! This turned out so pretty. I like the detail on the inside. 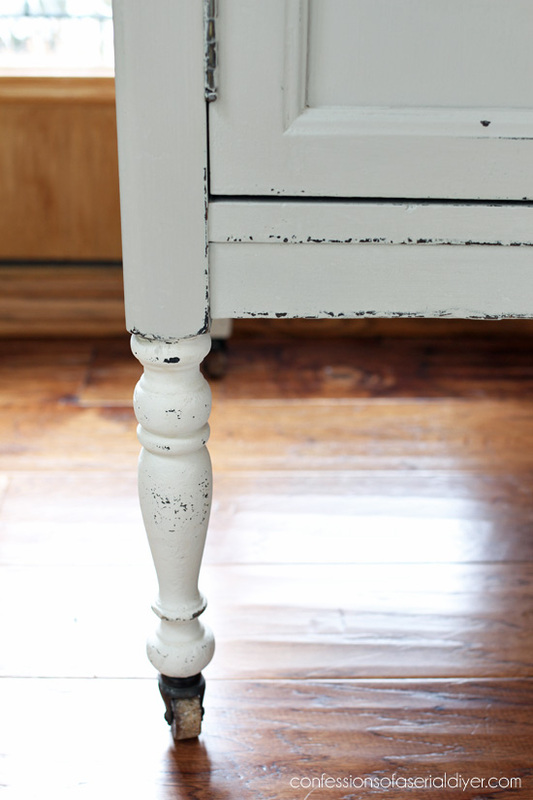 I use Old Fashioned Milk Paint and they have a product called Extra Bond if you don’t want a chippy look. I love working with their paint. In full disclosure, I am an Old Fashioned Milk Paint Brand Blogger but it is a great product and you can get all kinds of looks. I hope you will give it a try. This is a stunning makeover Christy, 👍Love the inside how you did it , it adds so much character! As usual great job!!! Ooh lala❤️❤️ Beautiful! 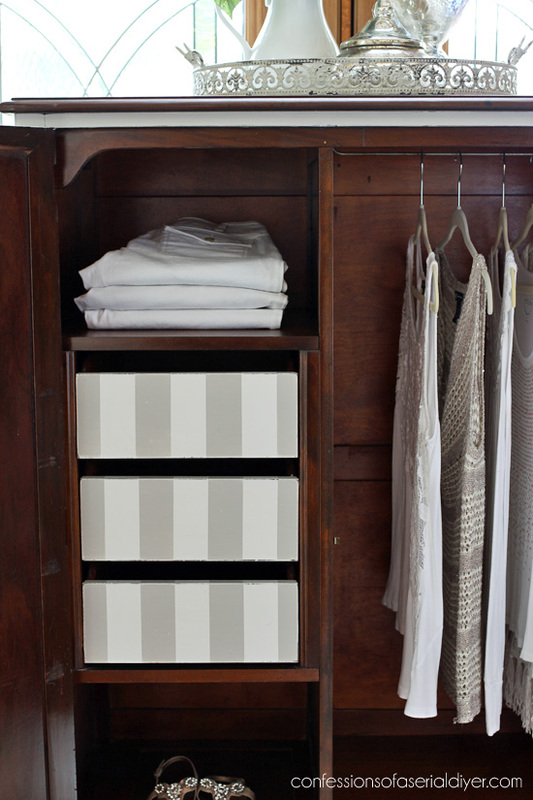 Love love the stripe drawers! It turned out so great! I love that you even added the detail of the striped drawers on the inside. Wowee wow. What a beauty! I started off thinking “Christy has lost her mind, paying $75 for a cabinet.” Then the big reveal of the interior – not a cabinet. It was a headache (and a learning experience!) but now it’s just marvelous. Good investment and great result! I couldn’t figure out WHY you put the white accent on doors…until you showed us the inside. I love the stripes on the drawers inside. I guess I was expecting a “stencil” on the doors or something. Yes how do you control the chipping. Too much work to redo but YOU did it. A wonderful find and I take it, you are not keeping it but selling it. Your booth is a nice outlet to “feed” your “habit.” Thank you. again for a great post. Fabulous! Like the finished make-over; just enough white to show off the piece instead of having all one color. I haven’t used milk paint before. I’m like you- I like the chippy finish it gives but have heard it’s unpredictable. All in all, your piece turned out beautifully. Even if it’s not what you initially wanted. Love. Wonderful makeover! Wow, this turned out great! Sometimes a choice word or two can speed the process along…ha! The old farmhouse I grew up in had only one closet and there was a chiffarobe in my room that I used. Speaking of the farmhouse, it bore no resemblance whatsoever to the current “farmhouse style”. oh it is delightful and I glad you went with the chalk paint. I am still loving the painted piece with the stained top. Okay… when I read ‘milk paint’, I may have actually let out a tiny gasp. And, my eyes may have gotten as big as saucers! LOL! Then I saw what was happening and I was sad, but knew there was a lot more to the post, so I calmed myself down. YAY!!!! You went back to your style, and I love it! Love the contrast between the wood and paint, too! Lovely! What a roller-coaster-of-emotion-type post! Whew! 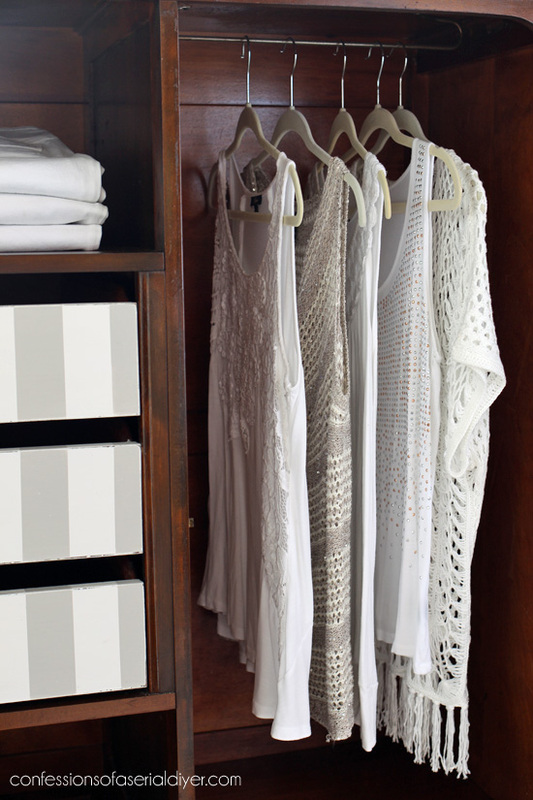 I love the armoire! 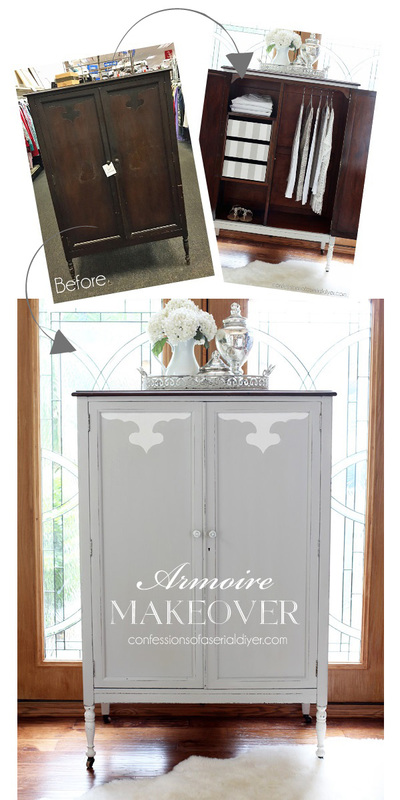 I used chalk paint to update my dining room furniture. 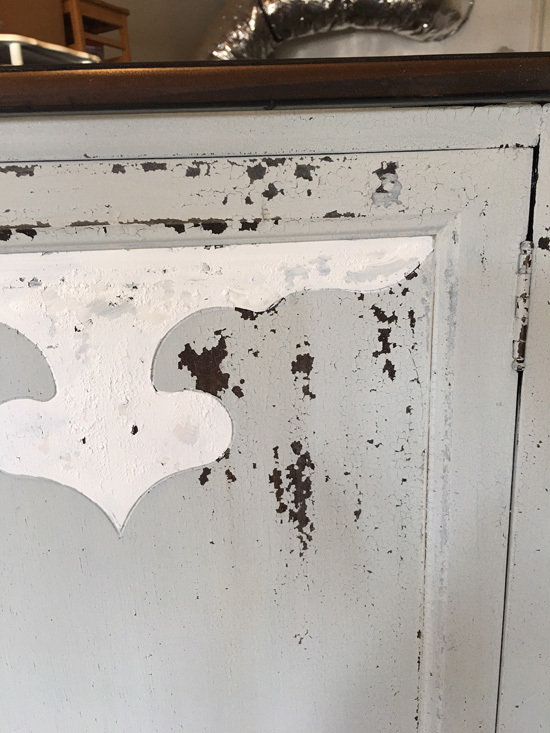 I never did figure out why a couple of spots on the top on the lower section of my hutch wouldn’t take the paint. I bought it new and it had always been covered by the hutch top so I wasn’t expecting some spots to bubble and peel. I sanded it down and used Kilz primer before painting it again. It was frustrating to have to stop mid-project to go buy primer, etc. but at least it worked! You should move to LA and be a stylist for the studios. You have the touch. I was thinking after seeing inside that your piece was meant to be a chif-a-robe. Only thing missing is mirror on outside of door which covers the closet area. Your save of this piece while frustrating to you, turned out as was meant to be finally. So glad you started again to give piece the finish it needed, is very lovely. How I would love to have your piece. What a gorgeous piece you made it into as it deserved. 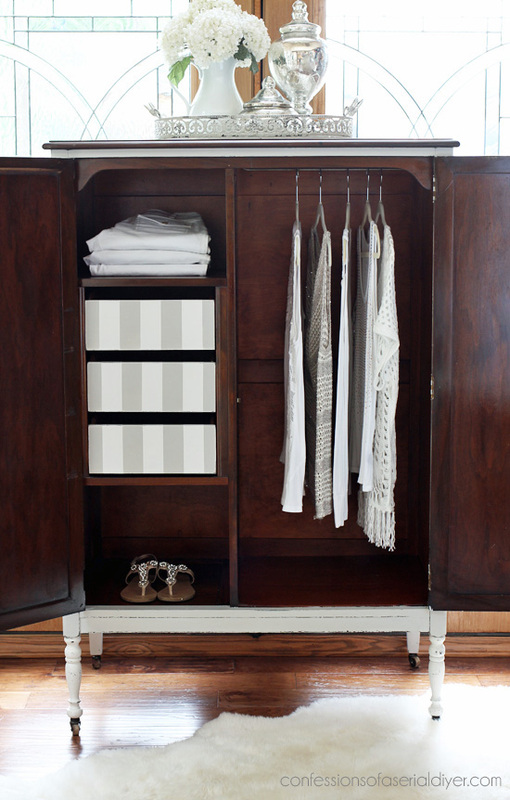 Christy, I’m feeling a little furniture envy:) This is such a great score and I LOVE the striped drawers inside. I can’t tell you how many projects I have re sanded, uugh. But, its all worth it in the end. Your final product turned out gorgeous! The new paint job is better! I love the lacy items inside! Sorry the milk paint didn’t work for you on this project. I love the way it turned out. Your hard work paid off. I also like the painted drawers. It adds some interest to the dark interior. It’s a great piece for a Guest Room or perhaps a child’s room. Love the stripes! 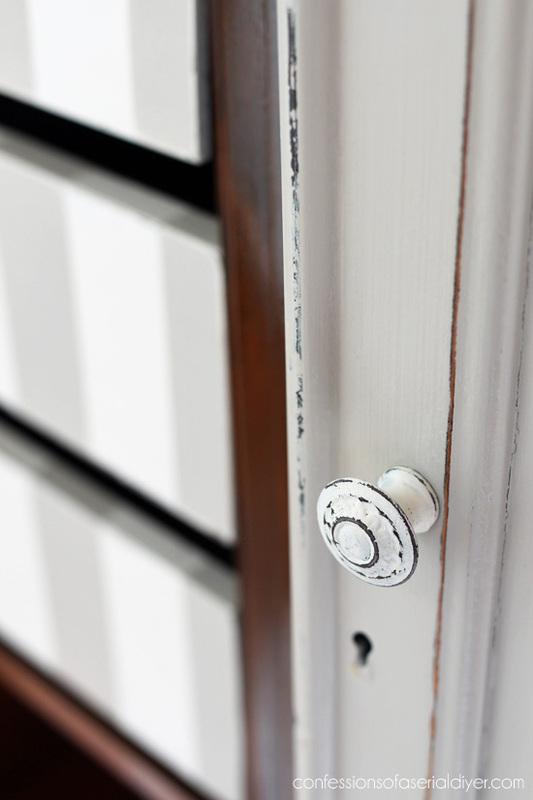 I find that whenever I shellacked a piece to prevent bleed through, milk paint chipped like crazy. Now anything requiring the shellac treatment gets painted with chalk paint.